The forum is free and open to the public, but registration is essential. Please visit https://bit.ly/2QICd6r or use the QR code here↓ to register and for latest program. ■ ACCESS：use the QR code here↓ to find directions to Osaka Innovation Hub, Grand Front Osaka. The Australian National Centre for the Public Awareness of Science of the Australian National University and the Center for the Study of Co*Design of Osaka University have joined together to lead the forum. 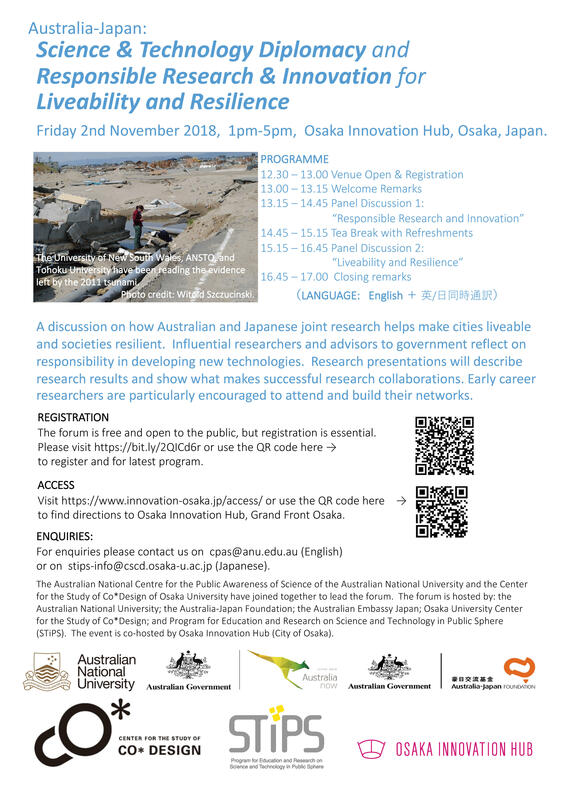 The forum is hosted by: the Australia-Japan Foundation; the Australian National University; Osaka University Center for the Study of Co*Design; Program for Education and Research on Science and Technology in Public Sphere (STiPS); and the Australia-Japan Foundation. The event is co-hosted by Osaka Innovation Hub (City of Osaka).